Alright, Se Kyung just lost almost all the good points she gained in the previous episode. We all knew she was determined in her goal, but it's one thing to hear it stated, and quite another to see her stomp in poor Park Shi Hoo's face because of it. I can't even say I completely dislike her, because she's at least reluctant about her actions. I am very curious on how she'll be able to recover from the face of her own selfishness, both personally and to the audience. All in all though, a very satisfying episode as usual, with steady progression and some long-awaited reveals. After the ending in the last episode, we get a sweet glimpse at both Se Kyung and Seung Jo holding their hearts. It's real for them both, but that doesn't stop Se Kyung from promptly reading Yoon Joo's chapter against love when she gets home, and throwing away the little bow she found from Seung Jo. That was my first indication that the girl wasn't going to go anywhere pleasant with the discovery that she's fallen for Secretary Kim. Seung Jo, on the other hand, was so adorable and optimistic after their encounter, clutching his little bunny and telling his friend all about how he was too afraid to kiss her. Love how this drama always manages to answer the little questions it stirs up for its viewers, like the how she couldn't Google image him before and why didn't he kiss her that time?! Well, we do get the kiss in this episode, but as far as PSH smooches go it's quite tame and abrupt. 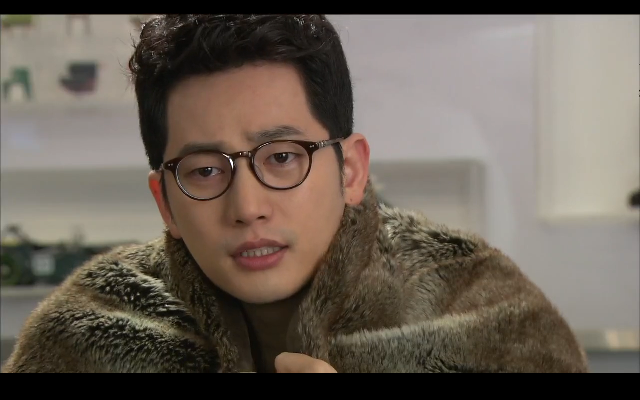 Mostly because of Se Kyung shoving him away before he could do anything. Sigh. Girl, this man is wasted on you. The "break-up" scene was also quite painful to watch from both of their perspectives. You could see the pain radiating from Seung Jo, and similarly, you want to kick Se Kyung and tell her she's pretty much screwing herself over. I was really, really hoping that she would see the light before this and decide to at least give the man a chance, but nope, she was bitchily straightforward and unrepentant in her rejection. This was a condemning moment, because we're made to see just how far gone she is with her goal. I hovered between distaste and pity for her the whole time, and while my affection for the character has cooled considerably, I'm still invested in her ending up with Seung Jo and do want her to redeem herself. Yoon Joo was in limbo most of this episode. Even though you feel sorry for her, you also want to tell her to grow some backbone and just tell the truth instead of continuing to run from it. I'm happy she eventually does so, but the dragging-her-feet part was frustrating to watch. Seriously, hiding from the man in the stairwell, then sobbing about it was just SAD, and not in an emotional way. Despite how outlandish the Moon-Ah Jung drinking-amnesiacs subplot was, it managed not to bother me. I predicted they'd remember the other's words at the same time, and lo and behold. Cheesy and so fake, but necessary to add story tension. I'm disappointed that neither Secretary Moon nor Ah Jung appear to be anything more than shallow fluff-balls performing necessary functions to move our main couple forward, but that's fine if it means limited, funny screen time I generally dislike when a drama over-dwells on side couples, so this is hitting the right balance for me. I also prefer a business-dressing-as-pleasure type of interaction between the two, because it's nice without being sappy or overdone. So, judging from episode 8's previews and the fact that we don't hear what secret Secretary Moon tells Seung Jo, it appears Se Kyung's gold-digger secret is safe for now. I think she's gotten off too easy in how conveniently the truth hasn't yet reached Seung Jo. But then again, if he learned about it this early, they'd probably never interact again, and that wouldn't be any fun. 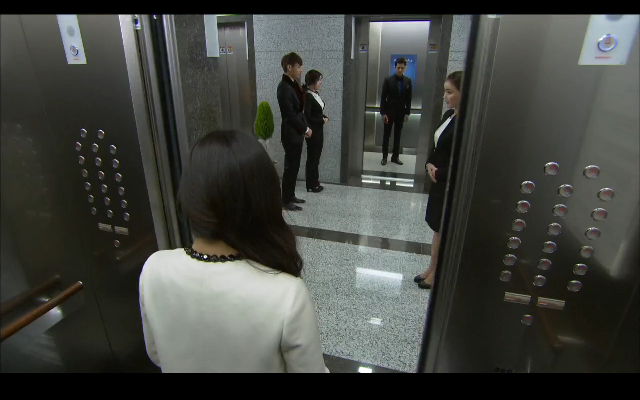 AND of course we get a convenient elevator-match-up to end the episode. At least they both look gorgeous. ARGH how adorable is this man??!! Thank goodness episode 8 is airing soon!